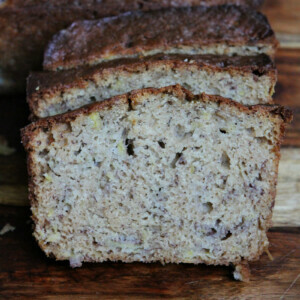 A tropical twist to classic banana bread! Preheat the oven to 350 degrees F. Spray two 8x4-inch loaf pans with nonstick spray. In a large bowl, whisk together the flour, sugar, salt, baking soda and cinnamon. In a separate bowl, whisk together the eggs, oil, applesauce and vanilla. Stir in the drained pineapple and the mashed bananas. Add the dry ingredients and stir just until incorporated. Divide the batter between the two prepared pans. Bake for 1 hour- or until a toothpick inserted into the center of a loaf comes out clean. Cool the loaves in the pans, then remove from the pans for serving. These loaves freeze beautifully. Just wrap them well and store them in your freezer. Take out to defrost and eat.